Today was a full day with lectures during the daylight hours, research at the FHL and two more lectures at night. The morning started with two excellent presentations by Thomas W. Jones on Constructing Case Studies of Complex or Contradictory Evidence and Conventional Formats and BCG Standards for Kinship-Determination Projects – big subjects packed with information. It is almost impossible to summarize a Jones presentation but I will try. Constructing Case Studies literally talked about a study having a beginning, middle and end. The beginning sets up the research subject, the middle proof summary discusses the evidence bearing on the conclusion of the research question and the end is short and to the point summarizing how the evidence supported the finding. The Kinship-Determination Project was about the types of format one can use – genealogy, lineage, pedigree or case study – and the method to achieve the format chosen. In both lectures he amply supports the methodology with examples from his research. The next presentation was by Jeanne Larzalere Bloom. (I am thinking that three names must be a requirement for women – Elissa Scalise Powell, Elizabeth Shown Mills, etc.) Jeanne spoke on The Family Tapestry: Integrating Proof Arguments Into the Genealogical Narrative. To obtain certification one must show at least two parent-child relationships in different generations. She went into some detail on proof arguments and how to use them effectively. Elissa Scalise Powell completed the day’s presentations by discussing Selecting Projects for New and Renewal Portfolios. She presented general principles like: do follow the instructions but don’t over think them. She talked about the applicant-supplied documents, the research report, the case study and the kinship determination project for new applications. The information was clear and concise and generated considerable discussion for there are many of us interested in certification. Then it was off to the Family History Library to look at microfilm of 1846 city plat maps for Des Moines, Polk, Iowa and the ultimate in eye strain. 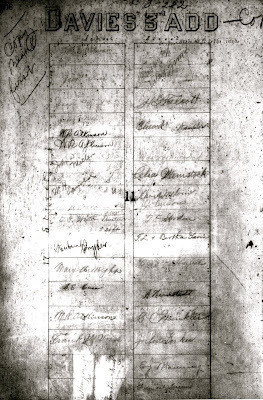 I did find my ggg-grandfather Mitchell Atkinson with property which may explain how his daughter Mary was there to meet her future husband, Galloway Mackintosh, who arrived from Scotland in 1850. Perhaps her father, a blacksmith, and Galloway, a stone mason, brought the trades people together? Back to the hotel for two more lectures tonight. Thomas W. Jones's presentation on Kinship Determination was amply supported by research examples as he held all in attendance spellbound. Elissa followed with Rubik’s Cube Genealogy: A New Twist on Your Old Data emphasizing organizing data differently giving many examples and good ideas to apply.